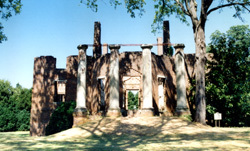 Preserved as a ruin after its destruction by fire on Christmas Day, 1884, Barboursville was one of the largest and finest residences in the region. The only building in Orange County known to have been designed by Thomas Jefferson, Barboursville was constructed between 1814 and 1822 for Jefferson's friend James Barbour, Governor of Virginia (1812-1814), U.S. Senator, Secretary of War, and Ambassador to the Court of St. James. 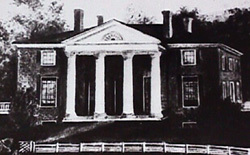 Jefferson's drawings called for a dwelling with a recessed portico on the north front and a three-part bay sheltered by a portico on the south front, with dome above--a scheme resembling Jefferson's own home Monticello. The dome, however, was not built. Even in its ruinous state, the house presents a romantic image of the Jeffersonian ideal, a compact but architecturally sophisticated classical villa in a carefully contrived landscape setting. The great oval in front of the house was originally a racetrack. The stabilized ruins are now the centerpiece of one of Virginia's first large-scale wineries. They also serve as an exceptional background for the Four County Players' presentations of "Shakespeare at the Ruins" on August weekends. Barboursville is located south of the junction of Rtes. 777 and 678. Self-guided tours of the ruins are allowed during the winery's hours of operation, 10:00am to 5:00pm. Monday-Saturday, and Sunday 11:00am to 5:00pm. Call 540-832-3824 or visit the website for further information.